Bill & Cora arrive, so no blogs for Six Days! Bill & Cora Kee arrived to stay with us last Thursday. Since they came, there have been no blogs as we were having such a great time!! 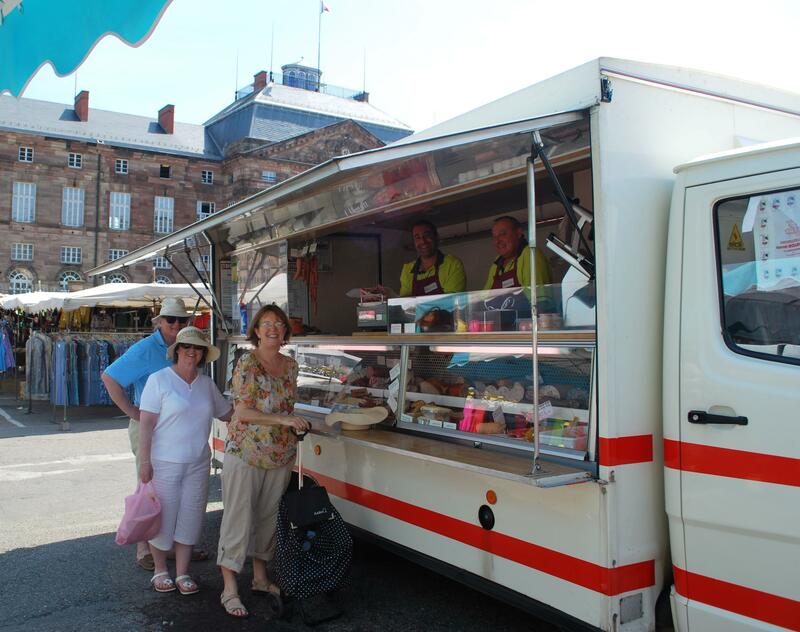 They joined us in Saverne, a beautiful town, North East of Strasbourg. 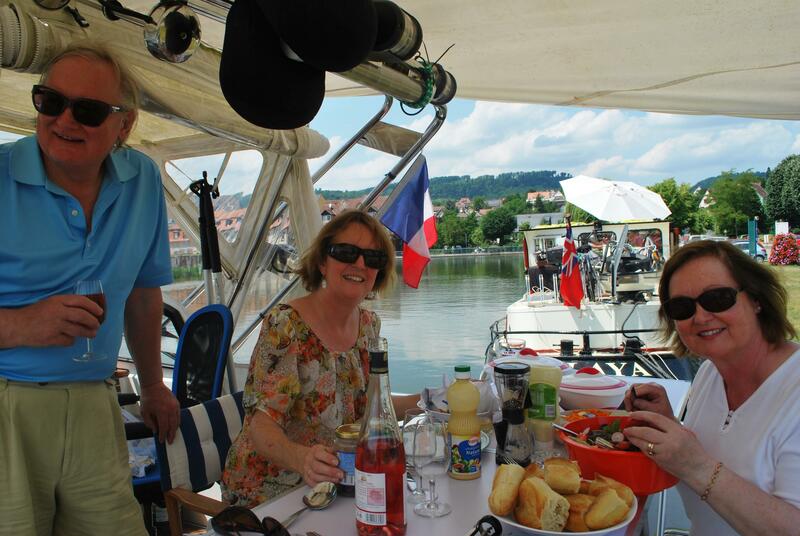 We moored facing Chateau Rohan and spent a pleasant morning wandering around the local market, buying fresh food for dinner that night, which Bill cooked. I visited a sewing stall and managed, with Bill’s help, to get thread and a large needle to fix our cloth canopy. I must point out, we had no help from Nuala and Cora, who were standing in the shade watching us! Cora got a new hat and Nuala refrained from buying anything. 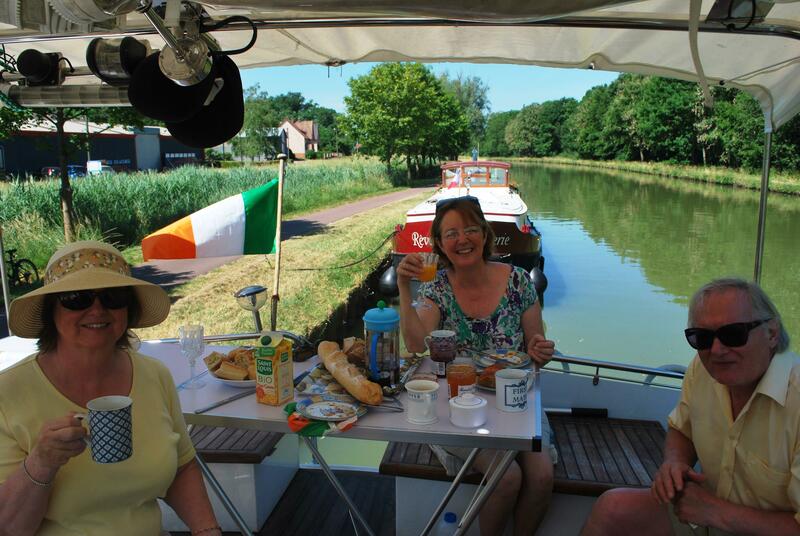 They cruised with us down Le Canal de la Marne au Rhin (Est) covering 31 km and 19 locks into Strasbourg, where we arrived on Saturday, passing the EU Parliament on the way into the city. They left us on Monday morning having spent two memorable days in the city. 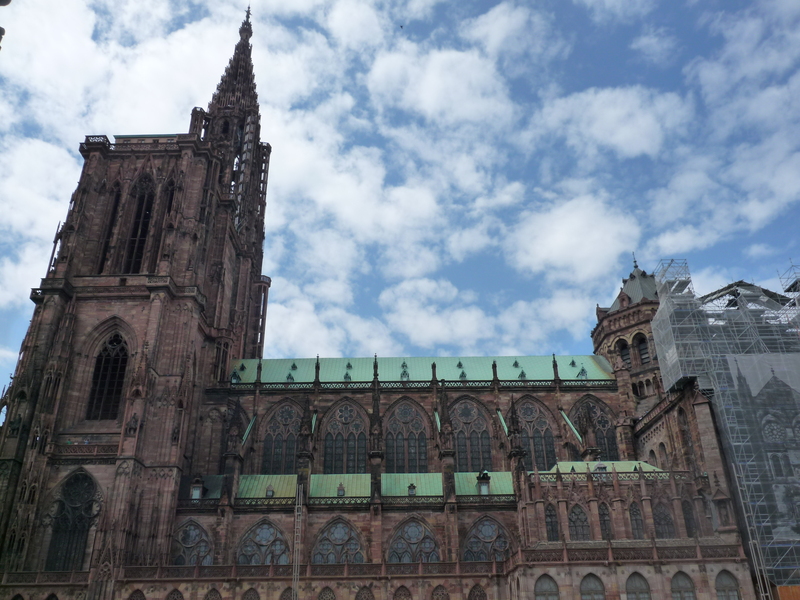 Strasbourg was better than any of us expected. 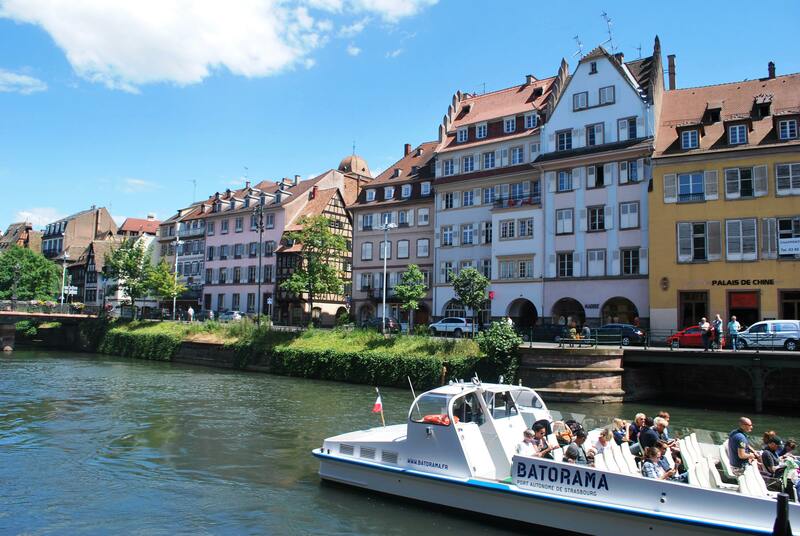 It boasts a magnificent Cathedral, a medieval city area called La Petite France with old timber framed houses many dating back to the 1600’s and lots of super restaurants and cafés . We even heard an American visiting choir, The Sonoran Desert Chorale from Arizona, singing in the Cathedral one evening. It was magical. Bill & Cora were very unfortunate when travelling. The train they were to take from Strasbourg to meet us was cancelled at the last minutes (due to a rail strike). They arrived by bus at 10.30pm, hours later than planned. If Xavier Hurstel, one of our French boating friends, had not rang to warn us that the strike was going to happen and we alerted Bill & Cora, they would not have found the alternative bus service. Unfortunately, also the day before they left, Bill got a text message to say the TVG train he had booked from Strasbourg to Paris was cancelled (strike again!) They managed to get on an alternative train to Paris but had to sit on a step all the way( having booked seats).These are the ups and downs of France! Now that they have gone, we are getting ready to go out on the mighty Rhine and start our adventures in Germany. We are both a bit anxious, as after almost three months in France, we are comfortable here and have to face new challenges. This entry was posted in C'est La Vie - The Boat, Comments on Social Economic Lifestyle in France, Experiences on the Canals, On the Journey, Places visited, Visitors to C est la Vie and tagged Bill Kee, Chateau Rohan, EU Parliament, Hochfelden, La Petite France, Le Canal de la Marne au Rhin, Saverne, Sonoran, The Sonoran Desert Chorale from Arizona, Xavier Hurstel. Bookmark the permalink. 1 Response to Bill & Cora arrive, so no blogs for Six Days! I’m sure you will handle the Rhine like a natural!! So far all the challenges have been overcome and the Rhine will be no different – bon voyage! !